Hauling cat litter is a chore, scooping it is a drag and catching a whiff of it can be offensive. But a new brand called Green Tea Leaves aims to make living with felines more pleasant. American spend more than $40 Billion in pet products this year! 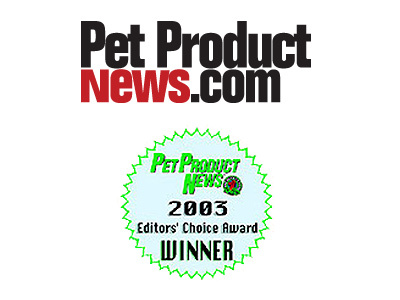 Next Gen Pet Products’ “Green Tea Leaves Cat Litter” was selected by Pet Product News as “2003 Editors’ Choice Award” winner in the December 2003 issue. Cat litter: Hauling it is a chore, scooping it is a drag and catching a whiff of it can be offensive. But a new brand called Green Tea Leaves aims to make living with felines more pleasant. The main ingredient is (you guessed it) green tea leaves, which have natural anti-bacterial properties thanks to a chemical compound called catechin. Drinkers of green tea have been known to re-use the brewed leaves by drying them and scattering them in the cat box to absorb odors. Green Tea Leaves litter boasts “maximum odor control.” One bag supposedly lasts a single cat up to a month (with two cats, one bag lasts two weeks). So, how does it rate with cat-lovers? “It’s on a par with World’s Best Cat Litter, the brand I normally use,” says Hell’s Kitchen resident Marcia Winter, who has six cats. 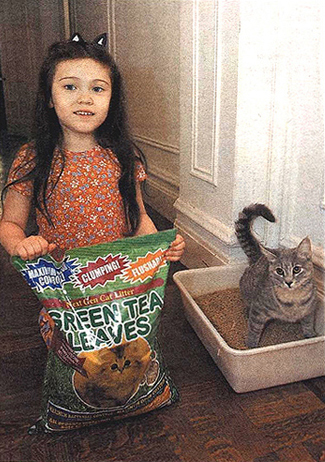 Upper West Sider Madeline McGaw adores Toyota, her gray tabby, but was at her wits’ end about the cat’s droppings. Currently, Green Tea Leaves does not have a New York distributor, so it’s not sold in stores but is available online at www.nextgenpet.com ($73.50 for five 7 Liter bags).